Life has suddenly and forcefully happened over the past few days, I thought things had been going a bit too well. Jeanie had her second litter in August, two babies on a Monday, one with fluid on his lungs and was very weak and we lost him at a day old :-( She then had another baby on the Wednesday (unheard of for us for such a long labour!) and this baby seemed very strong and the two survivors, both girls, pulled through and were very strong. Jeanie did a great job of looking after them, she's a brilliant mum. And then around 2 weeks old I realised the youngest kitten had a deformed ribcage, I have seen it before and heard about it, in some cases it can grow normally and in others it's permanent but the kittens can live a full and active life. As she grew, it became clear that this was a severe case and she was much slower to play and run around than her sister, finding eating difficult as we began to wean them at 5 weeks and her breathing grew more laboured. Then at 7 weeks she still wasn't eating unaided, we had to prompt her to drink and she would sit by the heater and watch her sister run around. Jeanie was still very attentive and hadn't abandoned her but she went down hill within a week and we made the sad decision to let her go on Friday 11th October; she was just 8 weeks old, despite our feeding her and keeping her as warm and comfortable as possible she wasn't doing at all well. Nicknamed Fidget at a few days old (because she could scoot around the nest so quickly!) she was a little character and so very sweet. I like to think she is running free at rainbow bridge, whole and well and happy. I miss her every day but I have her sister Pudding (she likes her food ;-) ) now named Jessie to keep me busy which I'm thankful for. Losing a kitten at a day old is bad enough but to lose another at 8 weeks is heart breaking and so difficult, in fact I considered giving up my hobby of breeding my cats altogether, the pain is horrendous when things go wrong. It still needs some serious thought. Sleep tight baby girl, we miss you so much! 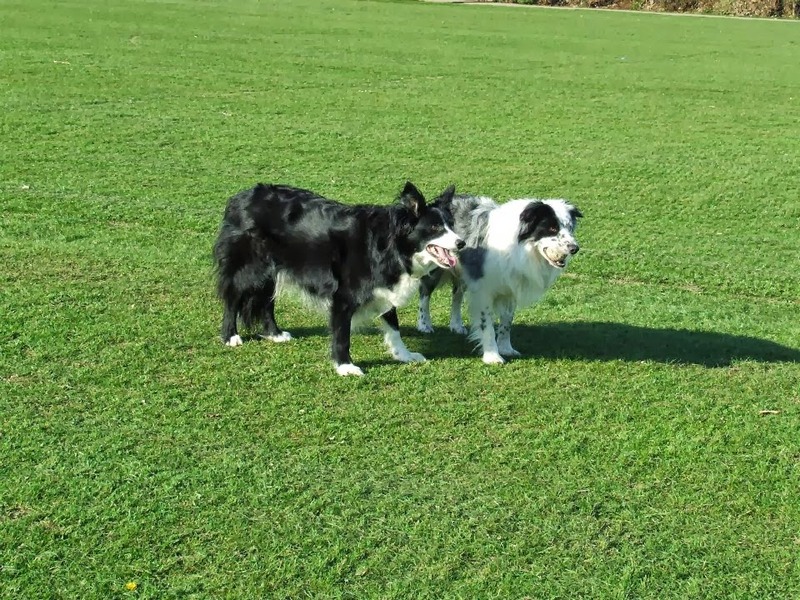 And now it's taken a few days for all of us to process this and realise the permanence of our loss...we had to say goodbye to Bryn, our 13 year old Border Collie, on Monday 14th October. He had been very energetic a few days before hand and enjoyed a day outside with our other collies and my Dad on Saturday, even jumping up on to the sofa on his own (he had chronic hip dysplasia and had an operation as a youngster to remove the ball of the joint) so that was quite a feat for him at that age. It was a shock to see him Sunday morning laying quietly, eyes closed and barely able to move - we think he had a very severe stroke during the night which left him paralysed down his right side. Letting him go was the kindest thing to do for him but it has broken my heart. I made the mistake of thinking he was always going to be around, in my mind he was invincible and didn't let his bad legs affect his life at all no matter how many times we told him to calm down, not to jump around or run like a mad thing! But he knew best of course! 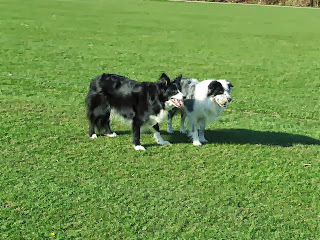 This was March 2012 in our local park, Bryn on the left with Aussie on the right..so glad I managed to take some pictures on a gorgeous day of my beautiful boys. Remembering two very special pets and members of our family, we miss them every day and I wish they were still with us, but I dream of them running free and happy at Rainbow Bridge with the rest of our pets from years gone by.